This subject of digital as in DMR is an Exploding system compared to anything in HAM Radio, bar none, and has been for many years as a dynamic mode that is often changing. A mode that is challenging the HAM radio community's user base as it evolves. This compared to the stagnant water of any "anything" or mode in Amateur HAM Radio. A network from it's inception that offered a single manufacture and commercial (M0torola public service) grade devices is now offering numerous hardware manufactures, important to note that no other HAM Radio mode offers as many hardware devices to select from when purchasing. The on "fire" prices are beneficial to the consumer as value for money and the wise understand this when choosing from one of many digital modes, as found in the many affordable devices that are offered in Digital Mobile Radio DMR market. The cost of DMR device almost comparing and rival inferior FM analog transceivers. Benefits include: device firmware exploits from known operators like Travis to Ty many new features, for the benefits of the end user or ham radio operator. With dismal advances in any other aspect of the radio hobby this is welcome change and may stimulate old bones in other areas of the hobby HAM radio. To the surprise and joy of many in the DMR community the introduction of Hotspots and its popularity continue to evolve and explode the digital user base, with the ability to shift users moving to self empowered devices and also have the option to use the many repeaters as backup if available for communication tools. As previously announced at the Dayton Hamvention, Radio Amateurs of Canada has secured permission for all Canadian Radio Amateurs to use special call sign prefixes to celebrate the 150th anniversary of Canada's Confederation. Brandmeister/Brandmaster - Brandmeister is German and Brandmaster is English. 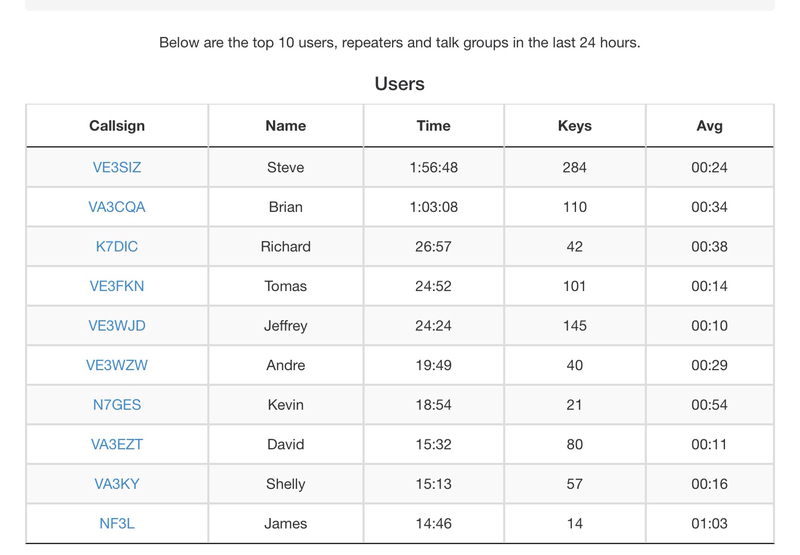 One of the big things I hear on Brandmeister is … What are the talkgroups? Well here they are. One thing you have to remember is reflectors and talkgroups are two different things. Reflectors range from 4000-4999 and are a link to a talkgroup. If you are on a DMR repeater and on timeslot 2 talkgroup 9 you can access a reflector as a private call to that reflector. Do a private call to that number, key up for a few seconds and then unkey. You will get a british female voice come back to you letting you know the number you are connected to. Doing a private call to 5000 will tell you what you are connected to, and a manual dial to 4000 will disconnect you. Using Un-programmed Codeplug - To make things easy, just program your radio for the "talkgroups". 1. reflector 4639 and talkgroup 3100 are the same thing. 2. Create a Private Call and Talkgroup each for the REF4639/talkgroup. 3. Just program your radio for TimeSlot 2 talkgroup 3100 and you are there. No manual dial needed. 4. When you are finished with your conversation, you can either disconnect using a created Contact and group “REF4000” keyup or the reflector will timeout after five (5) minutes of inactivity. 1. Dial your radio to the “VE3YYZ Local” channel. 2. Select the reflector name (e.g. REF4326) from the Contacts list in your radio. 3. With the reflector name highlighted, key your PTT. This will initiate a Private Call to that reflector and establishing your connection. 4. Exit from the Contacts menu in your radio. You can now make your call on that reflector using the VE3YYZ Local channel. 5. When you are finished with your conversation, you can either disconnect using the Contact “REF4000” or the reflector will timeout after five (5) minutes of inactivity. 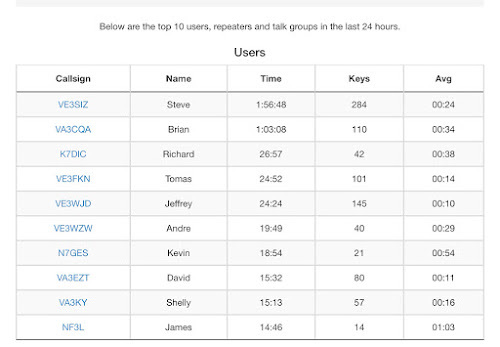 The chart below show the top 10 active DMR users for the last 24 hours. 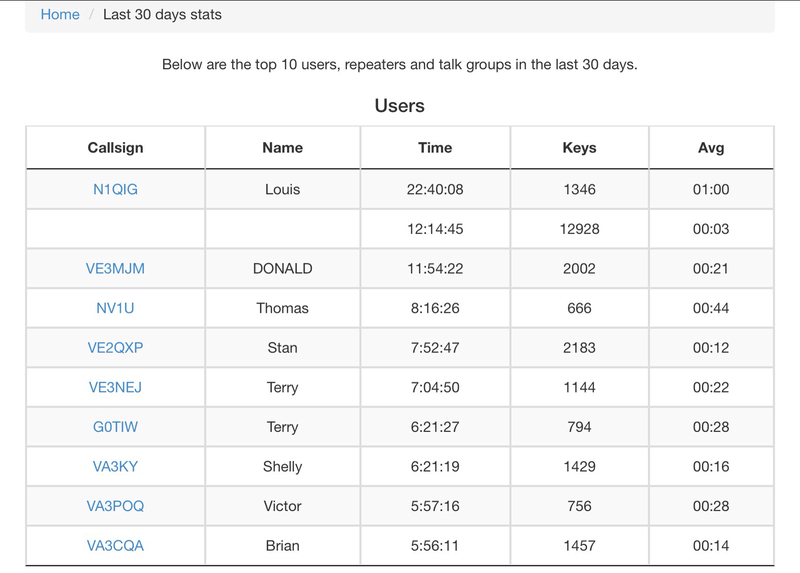 This taken from the LastHeard logging website ve2tax_com Stats values daily. 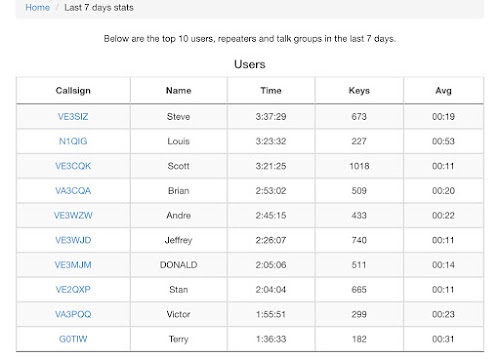 The below stats show the top 10 active DMR users most used for the week. This taken from the LastHeard logging website ve2tax_com Stats values 7 days or weekly. 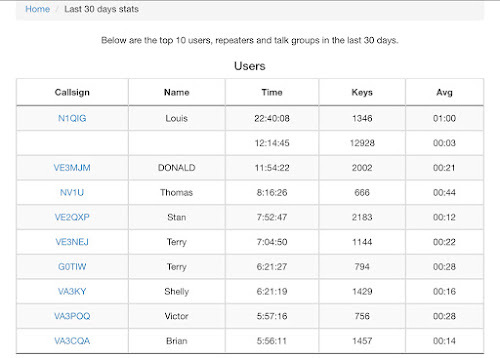 This taken from the LastHeard logging website ve2tax_com Stats values for the last 30 days most active users. These values are updated and change often on the website. Last year we broke the news about a new portable DMR radio, the KG-D901. We announced it on our blog, covered it in Episode 99 of the Two Way Radio Show Podcast, and gave the world a first look at it in our Wouxun KG-D901 preview video. Yes, it was certainly news, but it wasn't just about the radio itself. 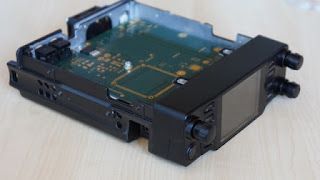 What made this newsworthy was the fact it was the first DMR from Wouxun, and it was an announcement of their plan to enter the digital radio market. Now their entrance is official. 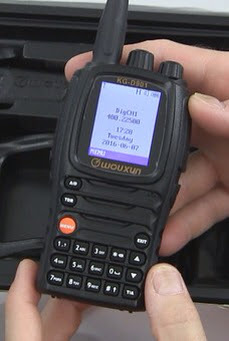 The Wouxun KG-D901 DMR Digital Two Way Radio has arrived! Since we've told you about the radio already, we won't repeat it all here. The info and specs on the Wouxun KG-D901 are available at Buy Two Way Radios, and now, so is the radio! There is just one thing to note. At the time of this publication, the Wouxun KG-D901 is currently available in a very limited quantity, so if you want to be one of the first to have it, you may want to get it now. The absolute highlight of the day was the presentation of the first NEWRADIO Funkgeräts which Funkamateuren of amateur radio was developed. A 2m / 70cm dual band mobile transceiver (see picture) with FM, D-STAR, C4FM and DMR. As Herzstueck "working" a 1.8 GHz processor with Linux Betriebssystem and 2 pcs. AMBE + chips, which the simultaneous listening or Send / listening of two digital Betriebsarten permit. An LTE Phone modem with SIM card works connect to the Internet, and thus will relay lists (with frequency, storage, etc.) and user list (call ID) automatically loaded. The code plug program necklaces belongs to the Past and awareness. For more information and pictures in the next QSP and especially after hamvention in DAYTON USA where this NEWRADIO mobile transceiver will have the official presentation. VA3.AGV Provided / donated a Motorola XPR4550 amateur radio as community support. 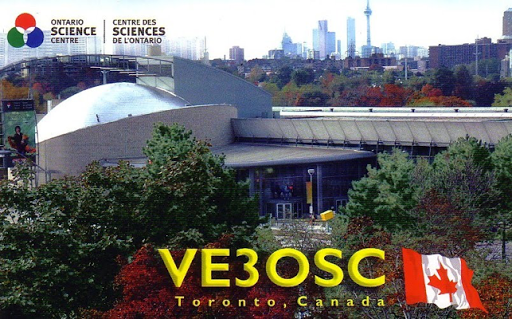 The Ontario Science Centre Amateur Radio Station, which operates under the call sign VE3OSC, made it’s first contact using Digital Mobile Radio, commonly known as DMR. 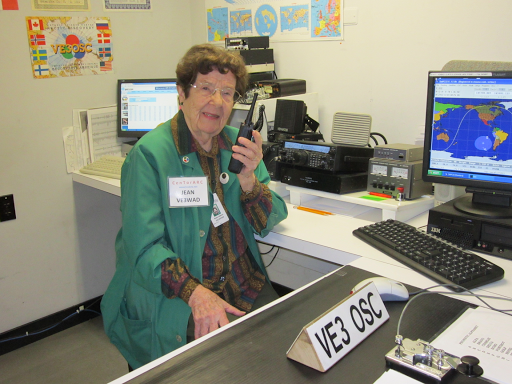 Jean Moffett, VE3WAD, who is a long time volunteer operator at the VE3OSC station. 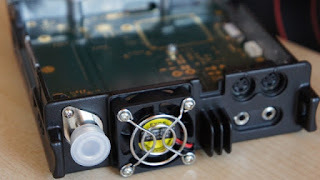 Compatibility between Yaesu's C4FM and Motorola "MOTOTRBO"
VE3WZW.net. Picture Window theme. Theme images by GP232. Powered by Blogger.